8 What To Look For When Buying A Food Processor? It is very difficult for homeowners these days to find just the right kitchen food processor that provides reliable functionality and high quality, coupled with great design, so if you have been looking for a top processor, but you can’t decide which model fits your needs and budget the most, our reviews, ratings and recommendations of the top 5 best food processors of 2019 is just what you need. We have reviewed and categorized several models on the market that you should deal with. Make kitchen tasks simple and easy. Covers the most food preps. The food processors on our article below are listed consequently from the most expensive to easily affordable and are already rated high for their outstanding properties and performance.. This way you can make a choice depending on your needs and your budget. I hope those reviews help you solve your buying woes, and you be able to find the best model, that fits your cooking style. So what is the best food processor to buy in 2019?! Weight 18.4 lb. 19.4 lb. 8.9 lb. 2 lb. 5 lb. A highly recommended top-rated food processor from a reputable and iconic kitchen appliances brand. It is the most expensive one on our list, but it offers much more spectacular features, and one of them is the powerful, brawny and quite 1200-watt motor,Which can reduce any kind of food in any quantity with a blink of an eye, without any obstacles. Features huge 16-cup(128 Oz) bowl of solid foods and 12(96Oz) cups of liquid which more than enough for any batch, besides a well-designed 2.5 cup mini processing bowl that turns your unit to a mini food processor for smaller batches for everyday use. Both bowls have a silicone seal to prevent any leakage when working with liquids like soups or sauces and both marked with ml, ounces, liters, and cups measurements. Coupled with 5.5 inches feed chute its wide enough to fit many whole ingredients and cut down the need for pre-cuts and saving you a fair amount of time and effort. 5 multi-function discs and 3 blades to cover almost every food prep, adjustable slicing disc gives you 0.3mm to 8mm thickness range and a storage position where the blade goes all the way down, and the best thing about these parts they are really easy to attach/remove and clean. I think it is a good idea to consider where are you going to store it before purchasing. The Breville features an easy and simple design to operate it has on/off and pulse touch-pads also an LCD timer which perfects for some recipes especially dough. In our test the Breville has succeeded with chopping, mincing, kneading, slicing, pureeing and mixing any ingredient he was facing in a few pulses. If you are cooking in large quantity, seeking extra blades and discs and willing to invest in high end food processor, then its the best option for you. Make sure to check our Breville stand mixer kettles, hand mixers reviews. 5 disc and 3 blades to cover every food applications. Equipped with a powerful 1200 motor. Somewhat heavy and bulky and may be difficult to store in a small kitchen..
Cuisinart is an well-known American brand for its high-end kitchen appliances, The Cuisinart 14bcny is one of their best and the most selling food Processors on the market today. A perfect balance of affordability and performance. The Cuisinart features a powerful and quiet 720-watt motor with On/Off and pulse paddles that are so simple and easy to operate, it is powerful enough to deal with any hard and thick ingredients you throw at it, even kneading a stiff dough. this motor can compete with more powerful and expensive motors like the Breville sous chef food processor, and you will barely notice any difference. and allow you to feed inside whole large ingredients and large chunks into the generous size 14 cup(112 oz) bowl without any trouble. Comes with 2 different sizes pushers the smallest had holes so you can easily drizzle any liquid without pausing the machine. In our test, the Cuisinart was great almost at every task we throw at it from chopping onions to slicing peppers, mincing and kneading an integrated dough in a short time. The only drawback was with shredding cheese the unit has failed to shred it equally and left some chunks between the disc and the lid. the Cuisinart food processor has a sleek and simple design so it can be easily assembled/disassembled. *dishwasher-safe parts so it perfect for those who like to throw everything in the dishwasher. Anyone who wants a high-quality, powerful and top-rated food processor without spending a fortune. Wide feed tube can accommodate various sizes and shapes. The blade sits quite close to the bottom of the bowl. Incredibly easy to assemble, use, and clean. Heavy which may be too difficult for many people to carry or move around. Only 2 discs and 1 blade. The Braun FP3020 Food Processor is a powerful, uniquely designed kitchen appliance which will help you to easily and efficiently accomplish all of your food processing needs; its innovative features are sure to delight both the novice and more experienced cook and make it an extra edition to any kitchen. Whether you prepare food often or occasionally you will love this appliance, it is easy to use and easy to clean, coming with 12 cups large bowl it will suit families of all sizes. At 14.9 inches by 11.3 inches by 15.4 inches and weighs 9.8 pounds, the Braun Food Processor has a relatively small footprint, but a large capacity bowl which is made of BPA-free, as are all of the machine’s parts that come in contact with food. (12 cups for dry ingredients, 9 cups for liquid (wet ingredients). A silicone seal greatly limits the possibility of leakage occurring during the processing of large volumes of wet ingredients. Its 3.5 inches long and 1.5 inches wide feed chute allows for larger chunks and even whole fruits and vegetables to be processed without these having to be manually chopped first, saving time and effort. Coming with a choice of 9 blades, discs and attachments, these deliver an impressive range and number of options. Included with this food processor are a chopping blade that will blend, mix, and puree, and a dough hook that can handle up to three pounds of dough. There is also a juicer that allows you to press citrus fruits for their juice right into the bowl. Additionally, there is a slicing system that allows you to slide, shred, and grate. It has a powerful motor, 600 watts, that is remarkably quiet when running, The motor will not engage if the bowl, lid and larger of the food pushers aren’t correctly locked into place. This, combined with the appliance’s direct drive motor which has a safety braking system and its non-skid feet, make the device very safe to use. The Braun FP3020 is one of the most highly regarded food processors on the market today, and it’s easy to see why. Coming with a handy wide feed chute for ease of use, a choice numerous discs and blades for convenient customization, this fabulous appliance will get the thumbs up from even the fussiest chef. Anyone who is looking to save time in the kitchen or having the ability to use one appliance for multiple cooking functions. Automatic locking feature to prevent the bowl to open while the unit in use. Both bowl and attachments are dishwasher-safe. Bulky despite being very light. Only comes in white and green. Renowned for its smooth food processing ability, the Cuisinart DLC-2ABC is one of the most popular in its price bracket. Anyone who has an opportunity to see it in action will be impressed with just how easy it is to use and how efficiently it gets the job done. If you love to cook, you will love this small food processor which cuts preparation time considerably and makes the entire cooking process even more enjoyable. If you love to eat gourmet meals but don’t enjoy the time and effort that often has to go into making them, the Cuisinart DLC-2ABC could help solve your dilemma. A powerful 250 watts, the unique design of the Cuisinart DLC-2ABC puts it in a class of its own. 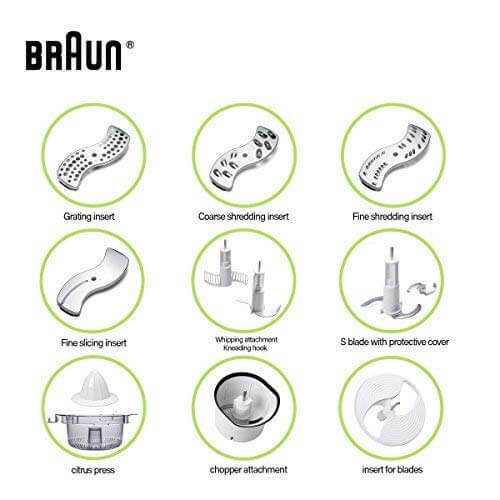 Known for it super-efficient blade patented reversible system; and it is made from surgical grade stainless steel. Measuring 7 1/2 inches deep, 5 inches wide, 9 inches high. and weighing around 2 Lb., this appliance doesn’t take up much counter space, and it can easily be relocated as needed. Three cups capacity bowl is BPA-free so you can use it long-term without having to worry about the possible health repercussions that are associated with BPA. Exceptionally user-friendly, operating the processor is a very straightforward process. With pre-programmed settings for everything from grinding and chopping, you really can’t go wrong. Utilizing a high torque motor, it is quieter during operation than some other mini food processor. The contoured design of the bowl minimizes the possibility of food particles becoming trapped, making cleaning very simple. The Cuisinart DLC-2ABC plastic body is durable and very stable. It will sit solidly on your bench top during use, even at the highest speed. Its coiled cord can be wrapped around the base for compact and convenient storage. If you are looking for a highly efficient small food processor that doesn’t cost the earth, take a closer look at the Cuisinart DLC-2ABC. Reasonably priced considering its functions and ability, it will manage all of your processing needs without skipping a beat. Bowl And lid are dishwasher safe. Comes in 7 different colors. Requires minimum space for storage due to its small size. Does not have a chute. You must remove the cover to fill it up. Extra preparation must be done before using the device. Not recommend to grind hard and stiff ingredients. The Hamilton beach Comes with a 450-watt strong and fast motor with 2 speeds plus pulse, it is strong enough to slice, chop, shred dense foods. so you are not going to be able to fit whole vegetable and fruits like apple or potato and you have to pre-cut them properly in order to fit in. Hamilton beach offers a stainless steel chopping-mixing S-Shaped blade which is perfect for chopping pureeing and kneading an excellent texture dough in a short time. yet no need to worry about stability and steadiness due to its lightweight, Hamilton added a suction cup on the bottom to prevent the unit from moving around your counter. despite in some cases, some soft ingredients like onions and cheese got over-processed. it can easily tackle most of your mincing, chopping, slicing, shredding needs. Who it’s For? If you’re looking for an affordable and durable food processor, I can say the Hamilton beach 8- cup is one of the best options out there. Very light, making it easy to carry or move around. Good at chopping, mincing, and shredding. Somewhat noisy for some customers. 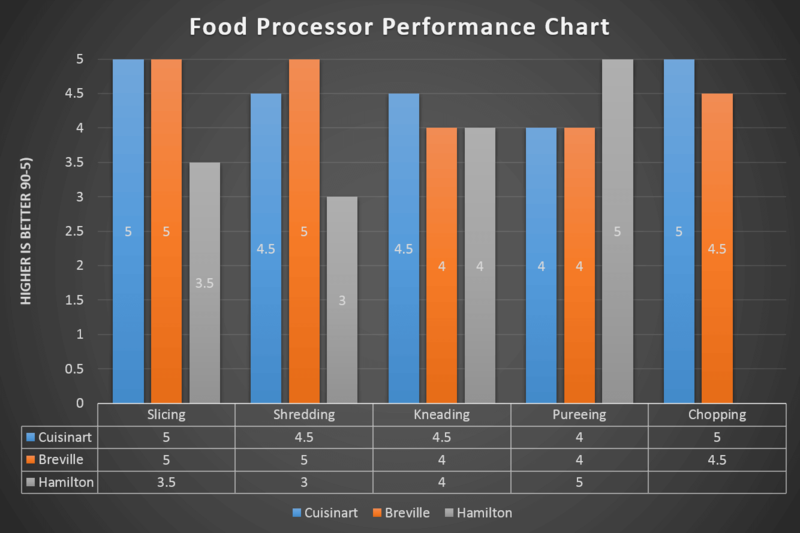 You can pick the top-rated food processors are listed in this article depending on your needs, budget and preferences. These incredible machines can help you prepare delicious meals and kitchen tasks without any effort. While buying a new food processor or any other kitchen appliance; it is always good to compare different brands and go through customer reviews online to know about the real-time performance of different brands. Once you buy a food processor for your kitchen; prefer to go through manual to know all safety and usage instructions supplied by manufacturers. It will help you to ensure long life service from your modern rice cooker. Did I miss one of your favorite food processors? Best Pasta Makers For Home Use. What To Look For When Buying A Food Processor? choosing the right bowl size is depending on the number of people you are usually cooking for and how often you are going to use the processor. but in general, for a family of 2-4, a compact processor should be more than enough. full size is perfect for larger families 5+ or for those who like to prepare several batches of a recipe or to freeze ahead. *If you prefer to prepare your sauces or soups with food processor always keep in mind to look out for a bowl with the max liquid line. If you are planning to use the food processor for chopping, slicing and shredding soft ingredients then a 400-600 watt is enough. but for heavy duty like kneading dough or grinding meat then consider buying a 700watt or higher. as a result, you will have less preparation cut and beautiful full slices. Very important point is to consider the warranty attached to each device, Different manufacturers offer different options for warranty. Commonly inexpensive food processors will have a one-year limited warranty at best, in more expensive you can get up to 25-year motor warranty with. Always double check warranty to have complete peace of mind. You don’t have to worry about safety features if you are planning to purchase a new food processor because all modern models follow strict safety regulation. but here some safety feature to consider: non-slip feet, bowl locks, protective latch on the lid. In the first place, we looked for a food processor that can handle a large quantity of chopping, shredding, slicing, pureeing, mixing and kneading, while delivering the best results. So we tested how every one sliced tomatoes and potatoes, chopped onion and carrots, kneaded pie dough and pizza dough, pureed tomatoes. And how much food left unprocessed and got stuck between the disc and the lid. We checked each food processor and rated it by the design of the handle, lid, food chute, bowl, blades, discs, noise, stability, and durability. And it one of the important features to look for before buying a food processor, our top 3 picks had a smooth and simple surface so it can be easy and fun to clean. The next thing we tested is the customer’s reviews and ratings on several platforms and consider their problem reports.